Podcasts are a resourceful way to level-up on your digital marketing skills. You can listen on your commute, doing housework, or even while you’re gaming. Download This Show hosted by Marc Fennell brought to your ears by ABC Radio National. Regular panellists include reputable tech journalists Ariel Bogle (ABC), Rae Johnsoton (Junkee), Claire Reilly (CNET), and Tegan Jones (Gizmodo). Listening will leave you with a high-energy understanding of the on goings in technology, digital politics, and consumer electronics. This weekly, short 28-minute podcast will bring you up to speed on all things digital and tech. Listen to Download this show podcast. Kate Toon (an award winning SEO copywriter and consultant) hosts this podcast for small business owners, solopreneurs, and bloggers. She talks all things Search Engine Optimisation with special guests, such as Joost van Valk (Yoast), Dawn Anderson (Move It Marketing), and John Mueller (Google). This is the podcast you need to drive organic traffic to your website, improve your content marketing, and want actionable SEO case studies. These bouncy episodes run up to half an hour and are released frequently. Listen to The Recipe For SEO Success Show podcast. Trevor “The PR Warrior” Young brings interviews with thought leaders in the Australian business and marketing world. Guests include Steve Vallas (Blockchain APAC), Tarran Deane (Professional Speakers Australia), Heath Evans (Melbourne Accelerator Program), Nic Hayes (Media Stable), and Yvonne Adele (speaker, business consultant, and Ms Megabyte). You’ll be standing up, standing out, and making your mark in no time. This weekly podcast runs about half an hour and will have you turning into an emerging thought leader in no time. Listen to Reputation Revolution podcast. Stevie Dillon is a social media marketing strategist and educator who shares her knowledge in The Stevie Says Social Podcast. When launched, it ranked #2 on the iTunes Business charts. She covers off all things digital, social, and content marketing with a bunch of Australian business advisors. The most popular episode informs listeners on how to crack the Instagram algorithm and beat the follow/unfollow game. These weekly episodes run anywhere between 15 minutes to a full hour. Listen to The Stevie Says Social Podcast. Nathan Chan is the CEO of Foundr Magazine and host of the Foundr podcast. The podcast launched in 2014 and opens with each guest describing how they got their first job. Hear answers from the likes of Lynda Weinman (Lynda.com Co-Founder), Noah Kagan (Sumo), Rand Fishkin (Moz Founder), and Gary Vee (VaynerMedia). This podcast is here to inspire marketers and entrepreneurs with interviews with some of the ultimate brains in business. Foundr is a weekly podcast and runs 30 minutes to a full hour. 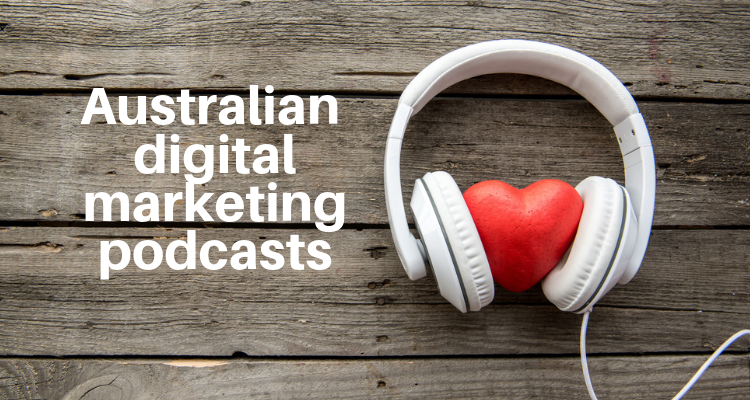 That’s just the tip of the podcast iceberg for Australian digital marketing podcasts. Do you have one that should be on this list? Let us know! Pamela loves furthering her marketing knowledge by reading up on the latest trends, listening to marketing podcasts and attending industry events. She graduated from the Masters of Marketing at RMIT, with a Golden Key Membership (top 15% academically). Her experience covers digital marketing, event planning and communications. Work she has contributed to has won W3 and The Content Council Awards. Pamela has promoted over ten brands and 600+ individual products/services across the business categories of education, real estate, media, construction and finance.